The Red Green Alliance and non-parliamentary socialists and global justice generation are the central actors one could hope for among the left wing to act against repression. But the main stream Red Green Alliance have all through the process been unable to discuss serious issues. The fact that the official party platform for the Climate summit only included emission targets and inter state North South issues and had no social revolutionary components of the kind advocated by the environmental, peasant and other movements shows clearly that the party have internalized main stream NGO visions of politics and is not relevant for popular movements. The effort that Red Green Alliance made at Klimaforum to arrange a debate with other similar left wings parties in other countries on strategy showed clearly that those parties have little of coherence to say. The Left wing party leader from Sweden made an appeal for winning elections and for the rest it was hard to find something that caused any reactions outside the circle of already converted. The dominant left wing media in Denmark is www.modkraft.dk set up when the Red Green Alliance did not afford to publish a weekly anymore. It is a broad publication reporting generously about civil disobedience actions, trade unions and the left in general. The assessment at this news web site starts by asking if a new movement is born. The main stream radical left wing with Naomi Klein and CJA activists had predicted that there was a potential for a new climate justice movement after the global justice movement that can continue anti capitalist mobilization into a new era. 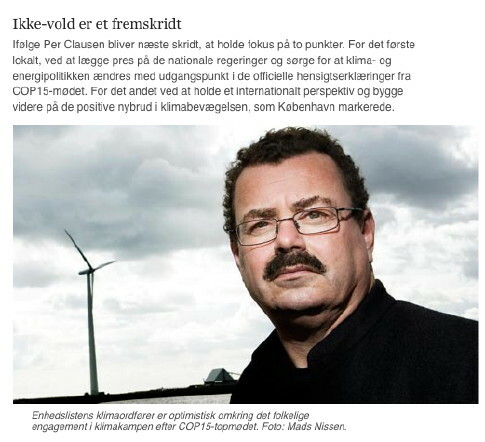 Per Clausen from the Red Green Alliance then takes center stage in the article. He cannot for sure say íf a new movement is born but he is optimistic, especially due to the large participation in the 12 December demonstration. ”Per Clausen also notes that the civil disobedient part of the movement, despite police mass arrests and imprisonment of the century people did not end in violent eruptions. This paternalistic clap on the head of the activists that so greatly resisted escalation into violence is interestingly combined with complete silence about the role of the left in individually supporting rather than collectively opposing this repression.